The new Toyota Yaris Hybrid has received an award as the model that boasts the lowest running costs and will offer market-leading CO2 emissions of 79g/km and fuel economy of 80.7mpg. With this brilliant balance of fuel economy and low emissions, it’s not hard to see why this model was able to beat off competition and emerge as the best in an accumulative period of 3 years. 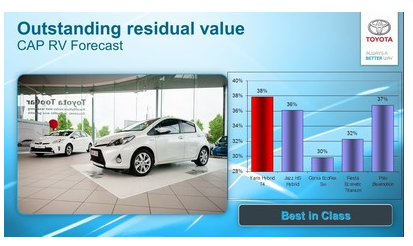 The car also boasts top-class residual value performance as predicted by CAP. The value stands at 38 per cent over 3 years and also has the least class taxation levels with zero VED, plus a 10 per cent BIK: overall, a whole 44 per cent advantage in terms of driver costs. The Yaris is the biggest selling Toyota in Europe and is the first ever B-segment car to offer full hybrid technology. The sharper, more aggressive looking Yaris Hybrid stores its power via a nickel-metal hydride pack and with fewer cells than those found in the Auris Hybrid, batteries are around 20 per cent lighter. Efficiency is superb, styling is sharp, handling feels secure and the light steering makes it easy to negotiate busy city streets. The seats are comfortable too and the cabin is roomy. There are three trim levels: T3, T4 and T Spirit sporting slightly higher levels of equipment at each step, with part leather upholstery at the top end. The attractively priced Yaris has a five-star Euro NCAP rating with all versions being equipped with seven airbags including twin-chamber front airbags and a driver’s knee airbag. The Yaris Hybrid is a clever package that promises genuinely frugal motoring and is arguably the most sophisticated version of the system yet and has been tailoredto suit the way peopledrive in the real world. The Toyota Yaris Hybrid shows Toyota doing what it does best: providing market-leading technology at an affordable price. If you’re looking to lease a new Toyota contact our sales team. Alternatively, visit our website where you will find new and used Toyota’s available for sale or on finance. I look forward to having this soon. I can’t wait to line it up with other hybrid cars for my renting company. It will be an added interest for my clients. Thanks for this article.